Sorry about that! I don't think Google offers us a way to turn that off. What problem are you having? Maybe I can help here. It's strange that my email address is rejected by google: my domain is of a public Spanish University and I email without problems to all different domains. Anyway, this is my problem: I've just installed synergy 2.0 rc1 in two machines running ubuntu 16.04.03 (after uninstalling previous version), but I wasn't able to find any clear instructions on how to proceed after installation. In the getting started page (https://symless.zendesk.com/hc/en-us/articles/115004888708-Getting-started-with-Synergy) it says that after installing "you can start the setup", but I couldn't find any synergy setup application in the Ubuntu installation (the only binary files installed are synergy-config, synergy-tests, synergy-service, and synergy-core). When installed, I can see a /usr/bin/synergy-service running. 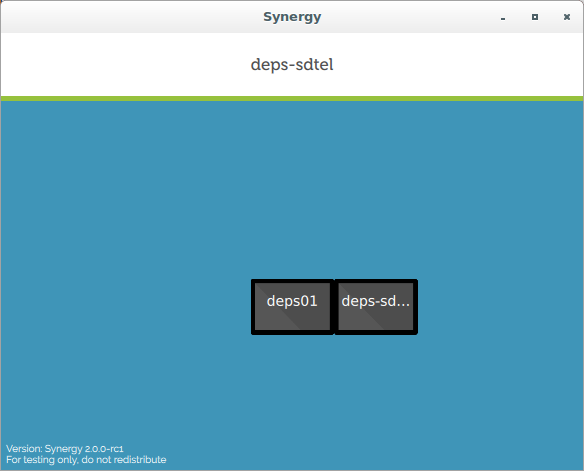 Then I tried to run "synergy-config" (is this the app to run the setup?) When run, it shows up with a window that requested me to sign in with Symless, which I did, and I get the window shown in the attached image, with two grayed thumbnails (similar one in the other machine). The application never requested a serial key, nor it showed any dialog box to configure as a server/client (the only info I get is when I right-click in any of the two screen thumbnails, and it reads "Share from ... Alt-S"). Could you please tell me how to proceed or if there is a published more detailed guide? Thank you very much and sorry for the trouble. Could you send us your logs? With the new synergy version I just downloaded (synergy_2.0.0.stable-b1026+060bdcb0_amd64.deb), I got the two machines working. I didn't do a full test, but I can share the keyboard&mouse.